Claire Foy has certainly been busy this year. 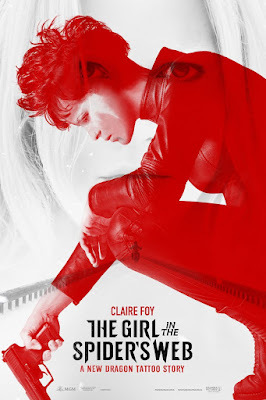 Straight off of the release of First Man, she's now back in theaters in The Girl in the Spider's Web: A New Dragon Tattoo Story, which is technically the fourth book in the Girl with the Dragon Tattoo series. I was a fan of hers from First Man, and, before that, from Netflix's The Crown, so I was curious to see how she would do in an action movie; however, she makes a very believable (and badass!) Lisbeth Salander. Lisbeth Salander (Foy) is helping steal a computer program ... back for its owner, Frans Balder (an underused Stephen Merchant), who is afraid what will happen if the program gets into the wrong hands. The program would let anyone who has access to it also have access to all of the world's nuclear warheads, among other weapons. Complications arise and soon she needs to find Balder's son, August (Christopher Convery), who is the only one able to open the program. With help from an old journalist friend, Mikael Blomkvist (Sverrir Gudnason), they will work together to find August and shut down the computer program, permanently. Foy was fantastic as Lisbeth here, and the supporting cast was great as well. I have seen the other two Dragon Tattoo movies—both the English and Swedish versions—and although they were good, I enjoyed this one much better. If you can, try to see this film on a large screen, as well—I saw it at the EMAX at Emagine Rochester Hills, and between the scenery and some of the motorcycle scenes, it was fantastic to view. Yes, see this movie, especially if you are a fan of the Dragon Tattoo series. I'm curious to see whether Foy will continue in the role of Salander, as there are a few other books in the series that the studio could adapt into movies; Rooney Mara starred as Salander in the 2011 English-speaking film, though, so it's possible that they could recast. If you are a fan of action films, definitely check out The Girl in the Spider's Web, as it was a fast-paced and clever movie, with a few twists and turns along the way. The Girl in the Spider's Web is in theaters today, November 9th, and is rated R with a runtime of 117 minutes. 4 stars out of 5.